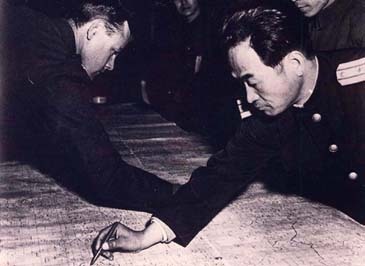 Armistice line is drawn by a US liaison officer Col. James Ray (left) and North Korean People’s Army’s liaison officer Jang Chun-San at the truce village of Panmunjom on Nov. 26, 1951 during the truce negotiation. 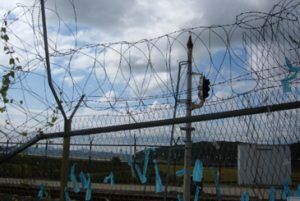 After the Second World War, and the surrender of Japanese troops who had controlled Korea, the nation was divided between the Soviet-controlled occupation zones of the north and the American-controlled south, along a boundary known as the 38th Parallel. So in 1948 this became the border of the newly independent countries of North Korea and South Korea. In 1950 war broke out between the two countries which resulted in a remarkable North Korean advance into the South which nearly pushed the US forces into the sea. An impressive counterattack by the United States and the United Nations combined resulted in much of the North becoming occupied. At this point, the leader of North Korea, Kim Il Sung, realized that the situation looked bleak so was preparing a retreat to the hills to engage in guerilla warfare tactics. Meanwhile, Chairman Mao Zedong of China sent in members of the People’s Liberation Army to help North Korea, and these reinforcements eventually led to North Korea pushing the war front back down to the 38th Parallel, resulting in a stalemate position between the two sides. The Korean War Armistice Agreement was officially signed on July 27, 1953 and resulted in a ceasefire between the two countries. However, a formal declaration of peace has never been signed, meaning that the two countries are still officially at war. The DMZ is the world’s most heavily fortified border and is patrolled by an estimated 1 million troops on the northern side, while 600,000 South Korean soldiers are stationed on the southern side, coupled with 37,000 Americans and some of the world’s most advanced military hardware. The DMZ has become a popular tourist destination, with some 180,000 visitors a year. Ironically, the lack of human activity within this 4 km wide/ 250 km long strip dividing the Korean Peninsula has led to an abundance of wildlife. Habitats have flourished and it has become a refuge for many endangered species.